Your quick, grain-free way to having the halwa and eating it too – with moderate amounts of added sugar and loads of micronutrients your way! 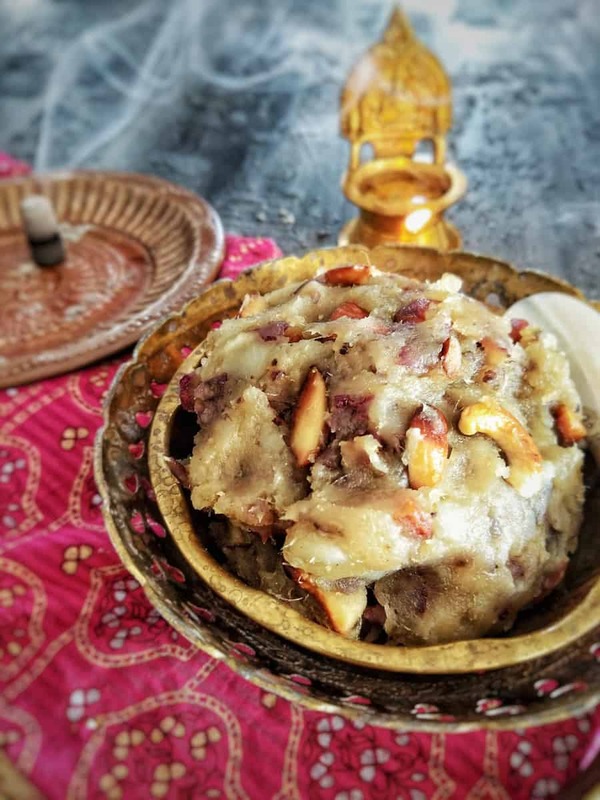 This sweet potato halwa can be whipped up in a matter of few minutes, and can be the most ideal quick-fix for your sweet cravings. 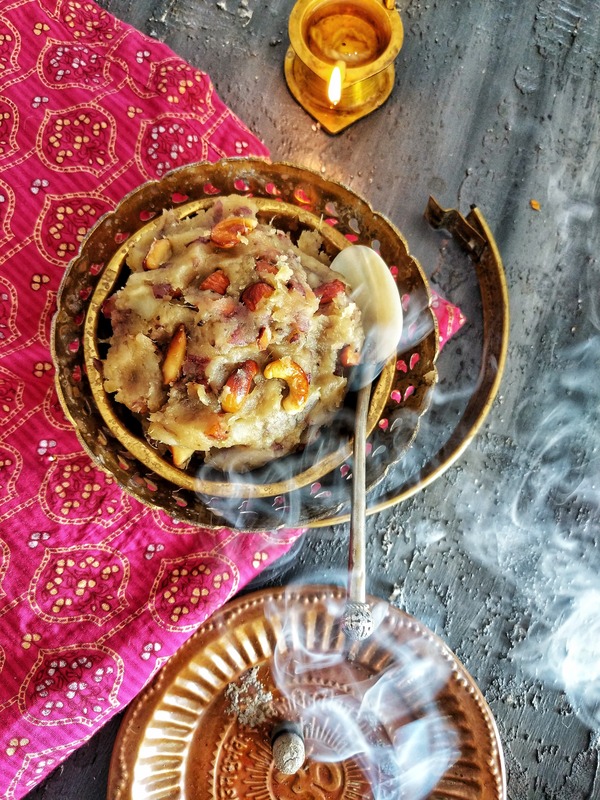 Read on to know the several benefits of eating sweet potato and how to make this delicious Indian dessert – thank me later! Festivals are incomplete without sweets, right? And sweets/ desserts quickly up your calorie intake – correct? So you should skip the sweets and tell yourself that big sacrifices are necessary for bigger results – right? WRONG! One thing that my ongoing journey with this blog and healthy cooking has taught me is that there’s always a solution. And if this so-called solution is tasty, healthy AND can be made in a jiffy, then that’s an added bonus of sorts. However, I need to clarify that the sweet potato/ shakarkandi halwa (an Indian/ South Asian dessert format with loads of dry fruits) is hardly an innovation – my mother used to make through our childhood whenever we spotted these purple-pink root vegetables and brought them home. Her simple motivation was the same then as is mine now – healthy, tasty, quick preparation and easy fix for sweet cravings. What makes Sweet Potatoes healthy? Sweet potatoes are rich in beta-carotene, an antioxidant that converts into Vitamin A upon consumption, which is crucial for good eye health. It is rich in most of B vitamins, vitamin C, iron, calcium and selenium. They also promote a healthy digestive system in addition to playing a crucial role in preventing ulcers. Research shows that moderate consumption of sweet potatoes plays an important role in management of Type 2 Diabetes. As is a norm with me, this recipe is free of refined-sugar free. I added palm sugar in moderate quantities, thanks to the sweetness of these potatoes, but you could add jaggery or stevia too as per preference. as I’ve used wholewheat and amaranth flours for the base and palm sugar for the sweetening. I don’t peel the sweet potatoes as I do not like to waste good fiber and minerals for the sake of good appearance, but you could peel them if you like the texture of your halwa to be restaurant-smooth. If you’re looking for more healthy dessert ideas, do try my other recipes like Cherry Upside Down Ricotta Cake , Persimmon Multigrain Scones or Wholewheat Banana Bread! Wash the sweet potatoes thoroughly and boil in a pressure cooker/ steamer. Set aside to cool and mash with the help of a fork when warm. Heat oil/ ghee in a non-stick pan. Fry the chopped dry fruits in the same until they achieve golden hue. Set aside. In the same oil/ ghee, add the mashed sweet potato mixture and saute for 2-3 minutes. Add cardamom powder and stir. Now add the water in which saffron strands were soaked and stir well until the ghee or oil starts separating on the walls of the pan and desired consistency is attained. Top with fried nuts and turn off the flame. *Recipe is for 6 servings; all values in grams.